Not really sure what all to put here. 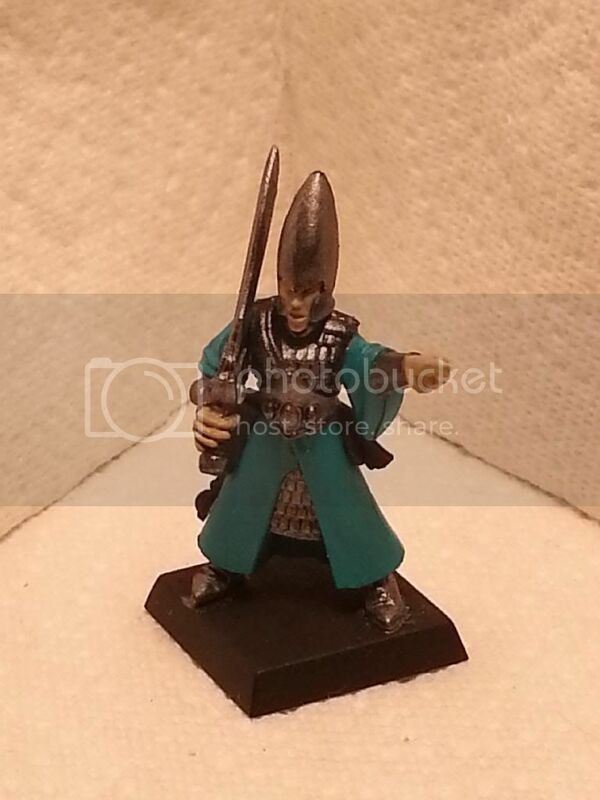 Going with a Cothique theme for the bulk of my army, with Saphery for my mages and SM. Dragon Princes are still going to be tied in with the colours of the dragons (I'm thinking green... because I'm not a huge fan of red and green seems a nice tie-in between the blue of Saphery and the aqua of Cothique). So far, most of it is WiP stuff so I'll start with what I have finished and then move on to WiP and stuff on the "to-do" list. Comments, critiques, suggestions, tips, etc are all more than welcome! Last edited by Duranthalis on Sat Dec 27, 2014 7:47 pm, edited 2 times in total. 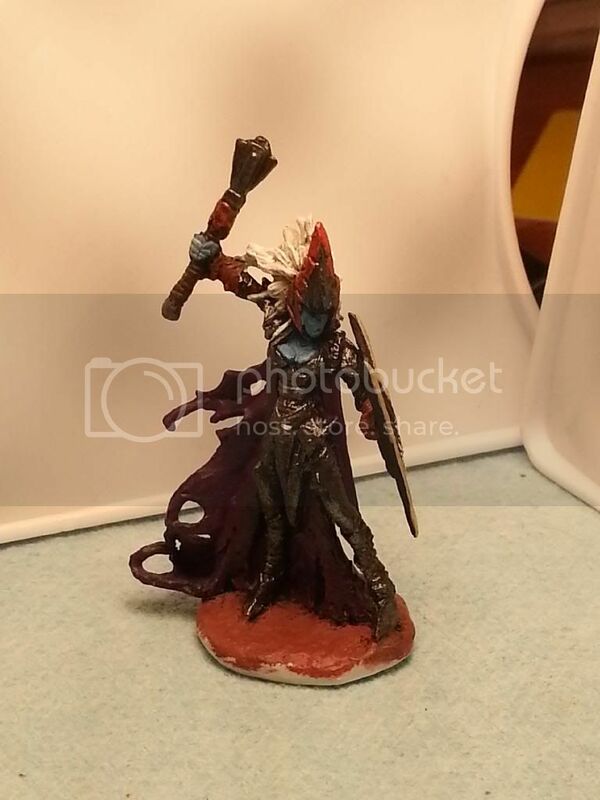 And the local GW store has all the entries up for the painting competition I entered the Everqueen for online voting. I don't care about where I place, it's for fun and we had all levels of entries. Note: this is not a grab for votes! This is to show off some of the efforts of our local gamers! Last edited by Duranthalis on Thu Dec 19, 2013 11:06 pm, edited 1 time in total. It's an interesting choice going for a mix of different regions and colour schemes. I'm looking forwards to seeing how it all pans out. Firstly: gems! 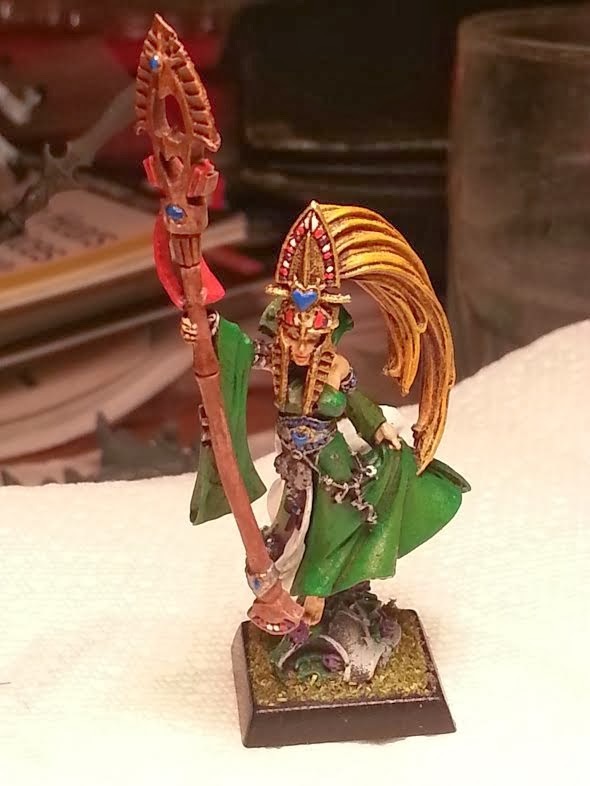 I think the choice of colour of the Everqueen's gems is spot on. It's a good contrast which makes them stand out, and it helps make her look even more colourful. However they look a bit dull to be gems at the moment imo. 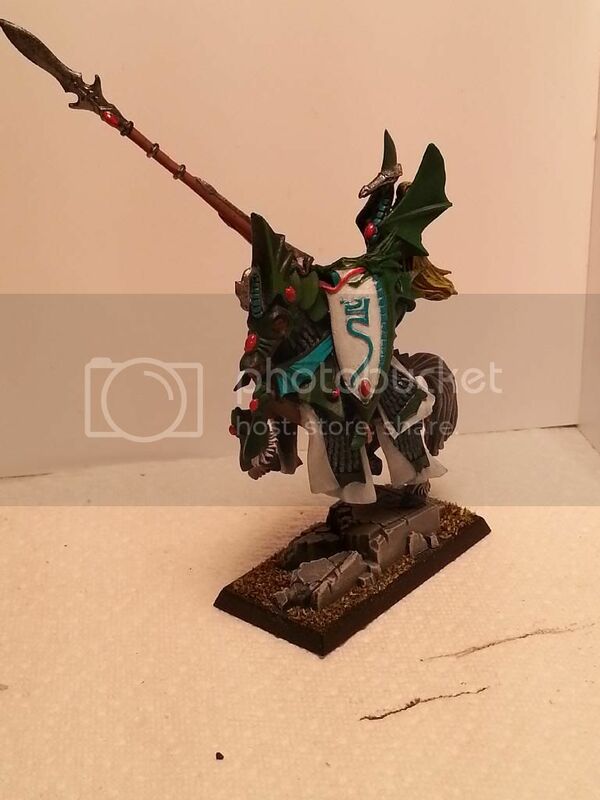 There are tons of different guides online that can explain how to paint gems far better than I can, but with the amount of gems on High Elves it's well worth learning as they can make all the difference is whether your models have that 'pop' or not. 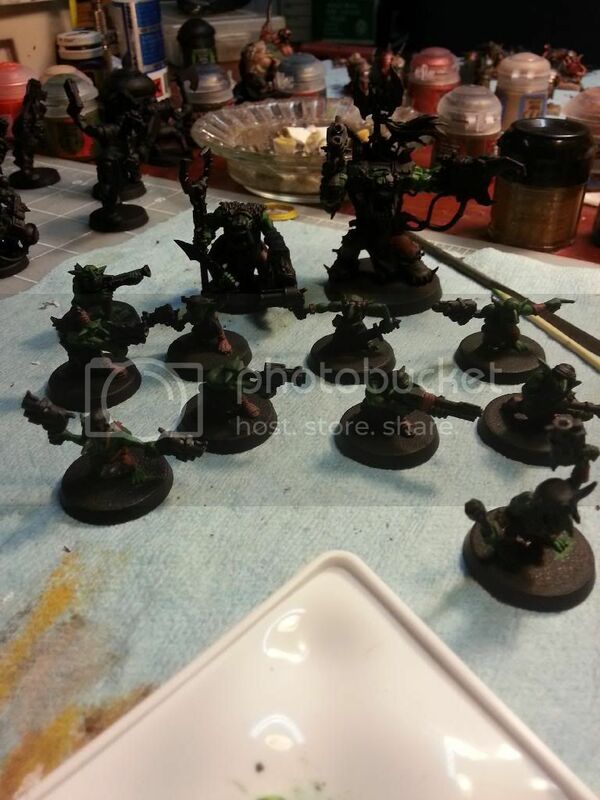 Secondly: I think a bit more highlighting could work wonders. 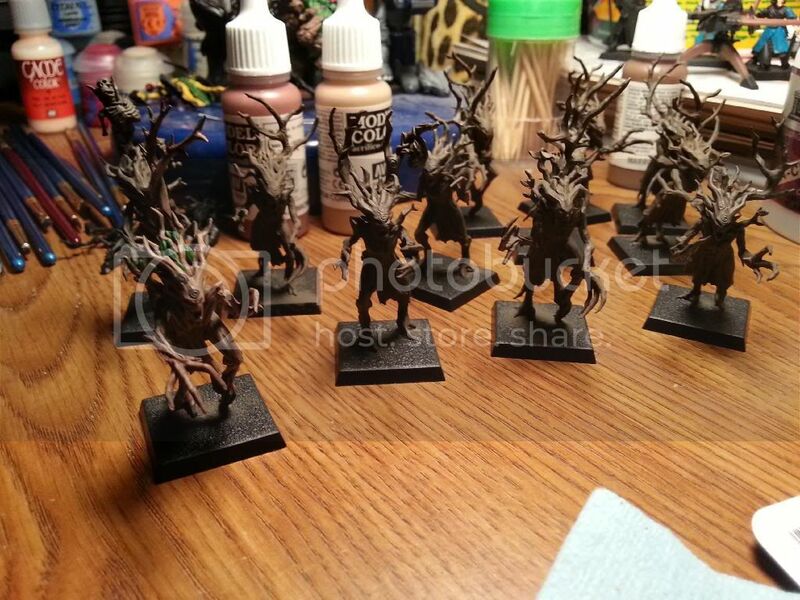 It doesn't have to be much, (perhaps a single layer of highlights in the next lighter paint would be enough) but it'll really help to make sure your painting never looks flat. I've found that working on my highlights has helped me to improve a lot. 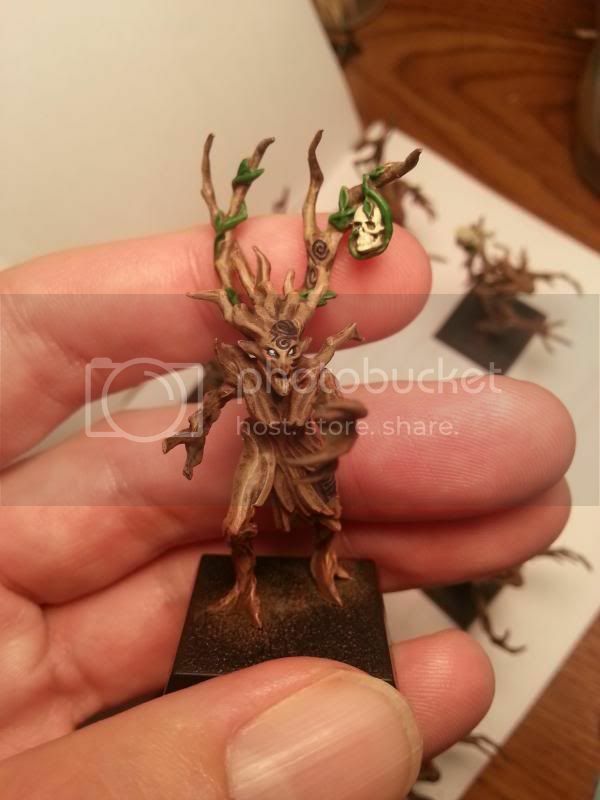 Not only is it good training at keeping your hands steady, but it actually gives you all the skills you need to do freehand work and teaches you about how light interacts with the models etc. Other than that all I can say is to keep it up! And make sure you keep posting pictures. 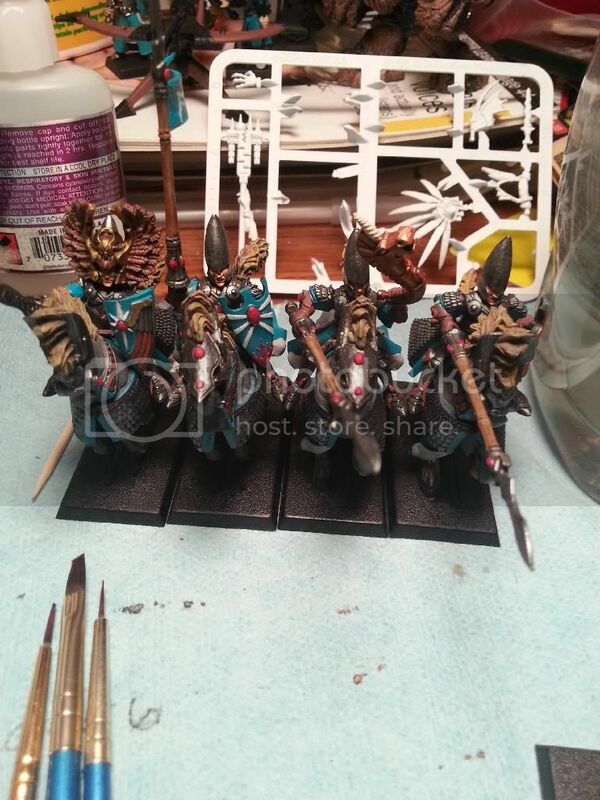 I can't wait to see the finished Dragon Princes. 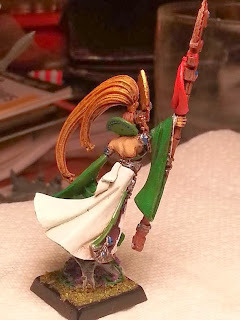 Highlighting is another one of those skills that I find daunting, but I'm trying to practice. 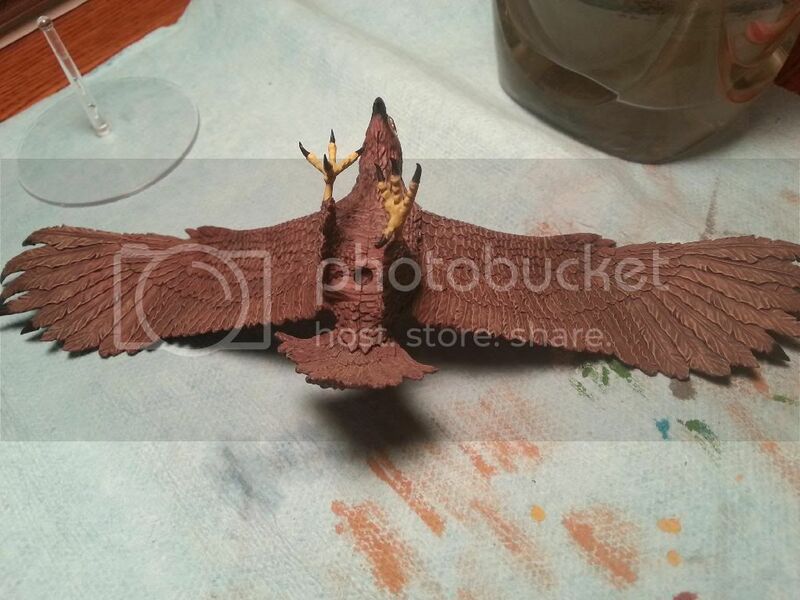 The blending on my griphon's beak was my first attempt ever with blending. 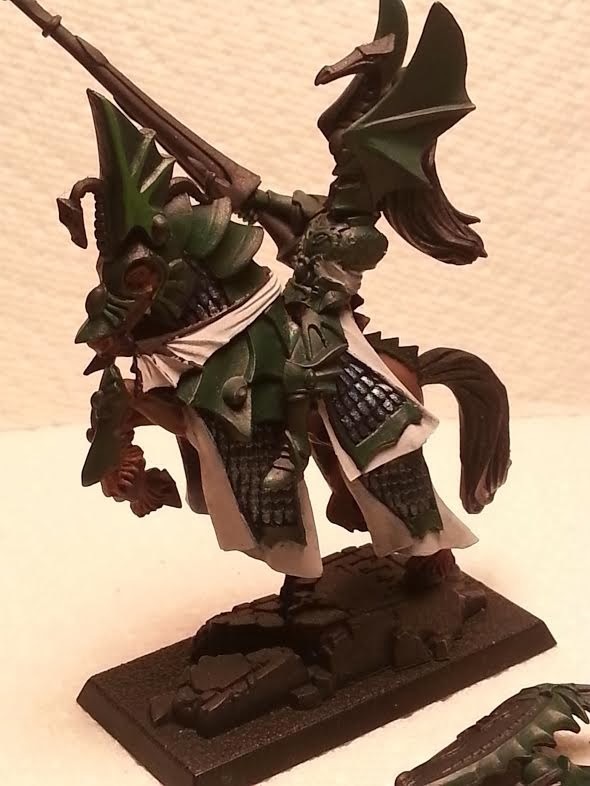 Finished my elf-steed mounted prince! Not 100% pleased with it, but mostly happy. I had intended the colour scheme for my DPs, and realized after I had already started that it was the wrong figure... but whatever. Sorry for the image quality, using my phone. As always, critique and comments are welcome! 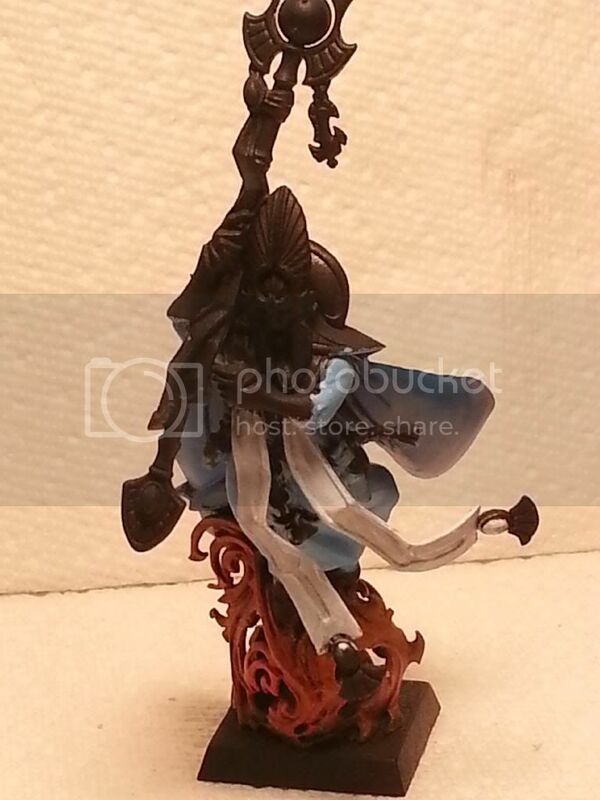 Prince looks pretty good, nice and neat painting, not sure if it's the light in the photo or not, but hopefully you haven't varnished the mini yet. 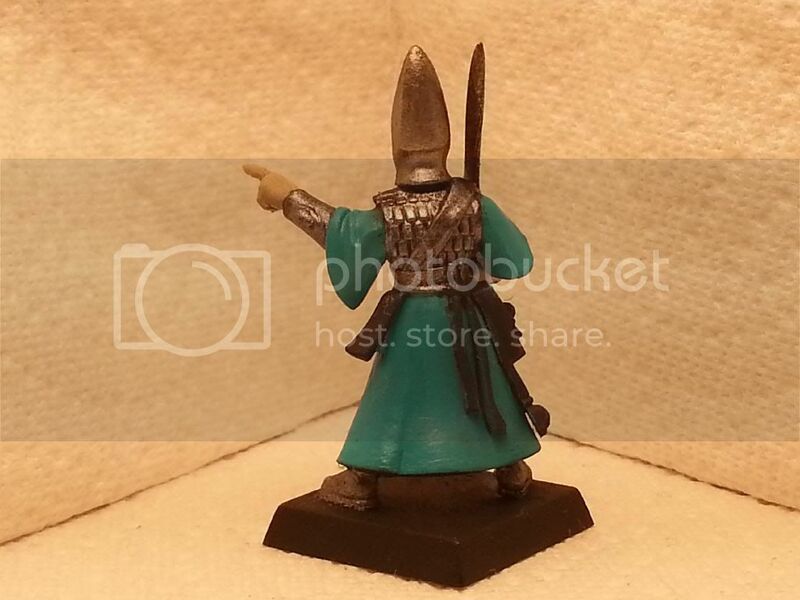 Just some small edge highlights on the mini would be enough to make him pop, as it is now the green looks a little dark and flat. 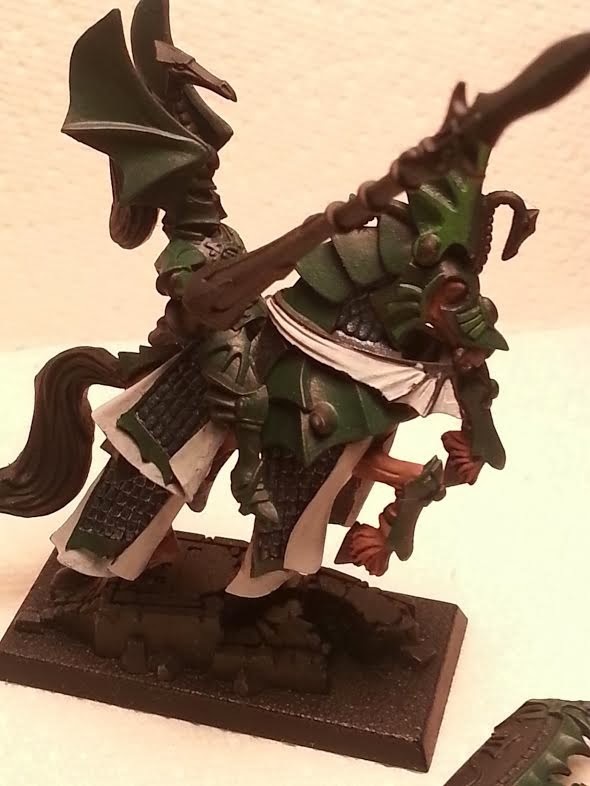 An easy way to do edge highlights for that type of armour is get the colour gradient of your mini, in this case green, then 50% of the ridges on the helmet and shoulder pads, do them a lighter colour green. Then 50% of that, the next brightest green. And so on until you're at the end. It doesn't take much effort or too steady a hand (trust me, my hand shakes). You don't even have to blend them properly if you don't want to, makes it easy to get through and once you've done that, the mini will look 10x better. 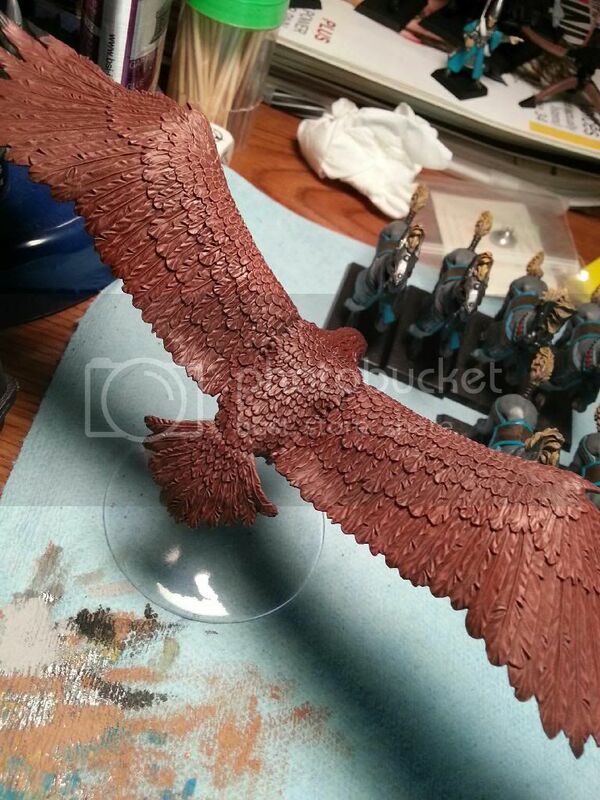 @Asarion: I haven't put any varnish on just yet, and plan on edging the armour. The photos don't really pick it up (bad lighting) but the plates are done in black green with a lighter green blended in from the edges of the plate, with a transparent green wash over the rest. 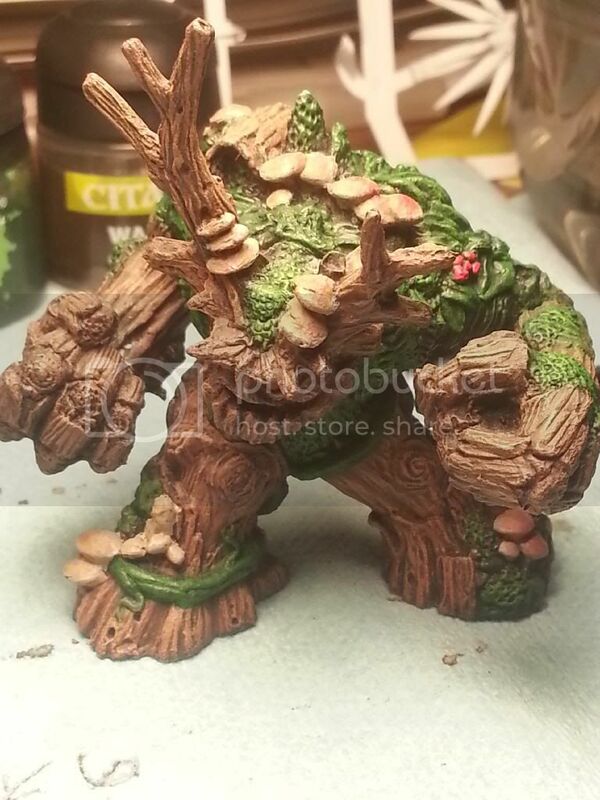 But yes, plan on going over it with a much lighter shade and doing some edge work to give it some definition. Before you do anything with that mounted hero, i would suggest running at least a black wash over all the white and green areas. this will give it depth and will make the contours of the model stand out. Obviously, you'd want to put thicker wash ove the heavier recesses, then once done add a highlight for each colour (in the case of white, just use white haha). I think the colours you've chosen here really have a potential to be very striking, but it will require some careful highlighting. I might even consider to paint the 'webbed' part of the shield arm's pauldron the metal colour - this will break up the green and make the armour look heavier and stronger. Well, I've seen some gorgeous DP's in green, my army is red, but that's no drama, the methods are similar. 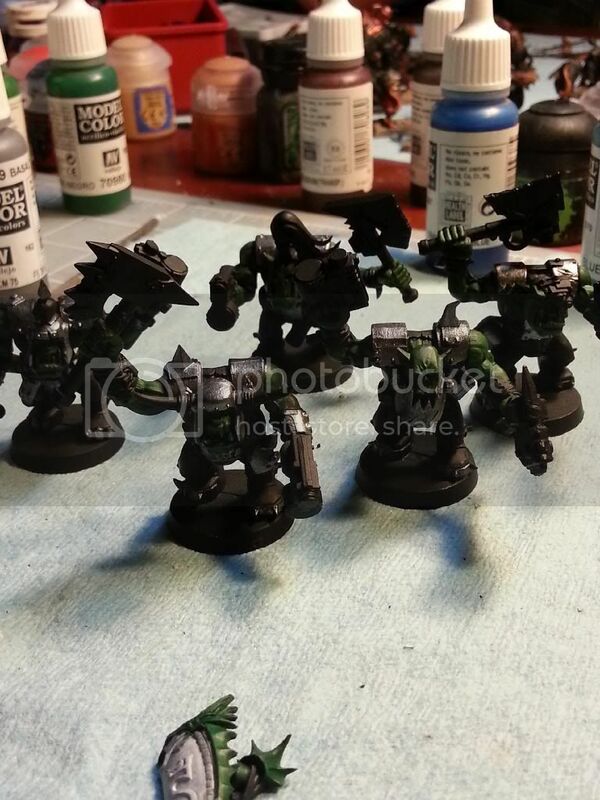 If you want to see how I did the edge highlights on a DP in red, check the secret santa I did in my plog, I'm pretty sure the same technique would work in green. 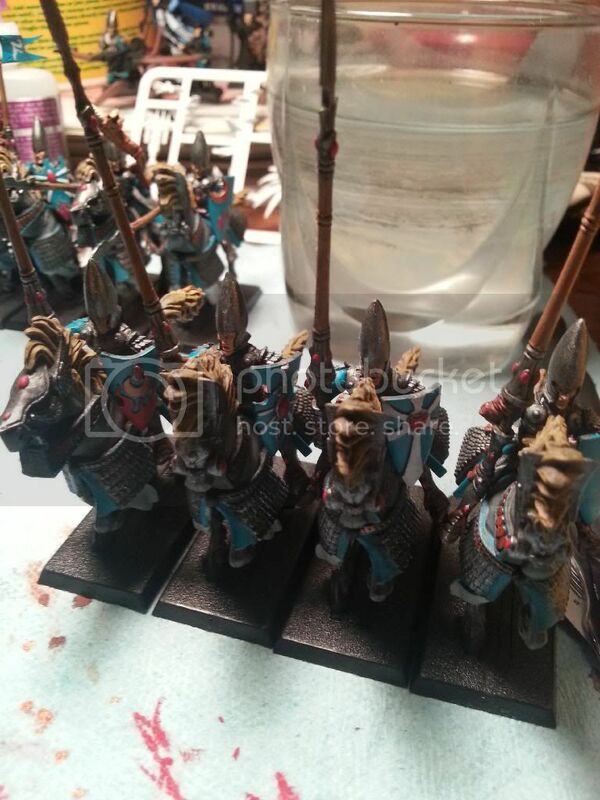 I'd advise against using a black wash over the white as well, since it can give it a dirty look, I'd advise making a glaze out of one of the greys (such as Ulthuan Grey) for a cleaner look. 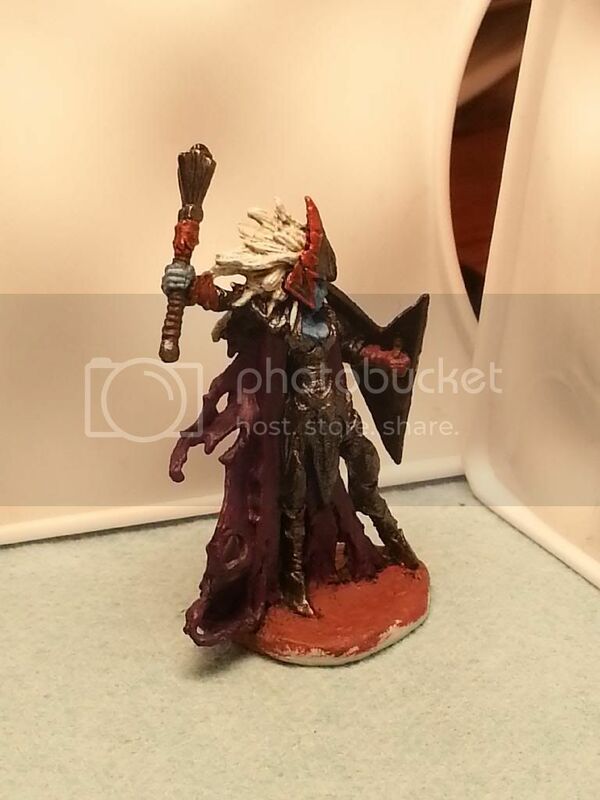 Hit it with a black wash, then did the highlighting on the edges. Hit the white parts with a charcoal grey wash and then tried to hit the higher parts with white. The pictures don't do it justice, but it does look better than it did before. Now, My next step would be to touch the very edges of the darker green areas with one or two shades lighter (looks like you've done it in some places but not ALL the dark green areas). 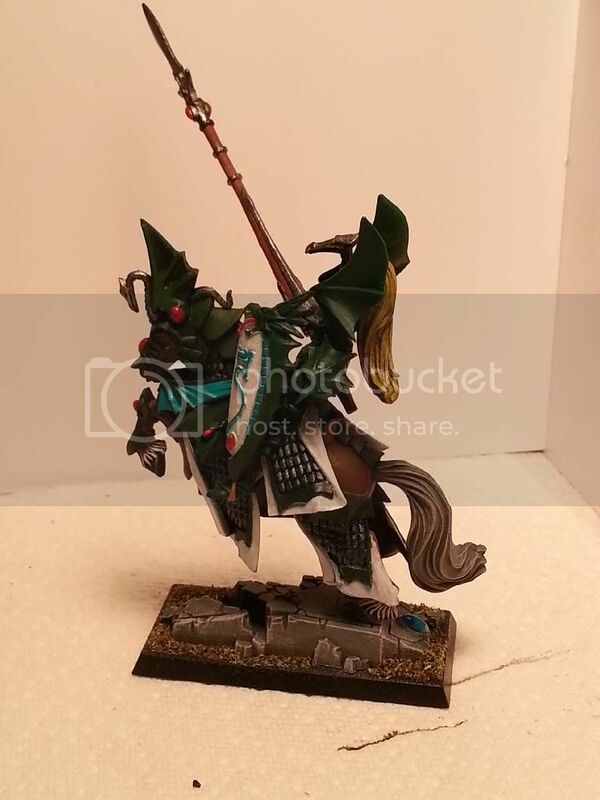 I'd also use that lightest green instead of black around the scales as I think it would really stand out well - but that's me, and this is YOUR model! 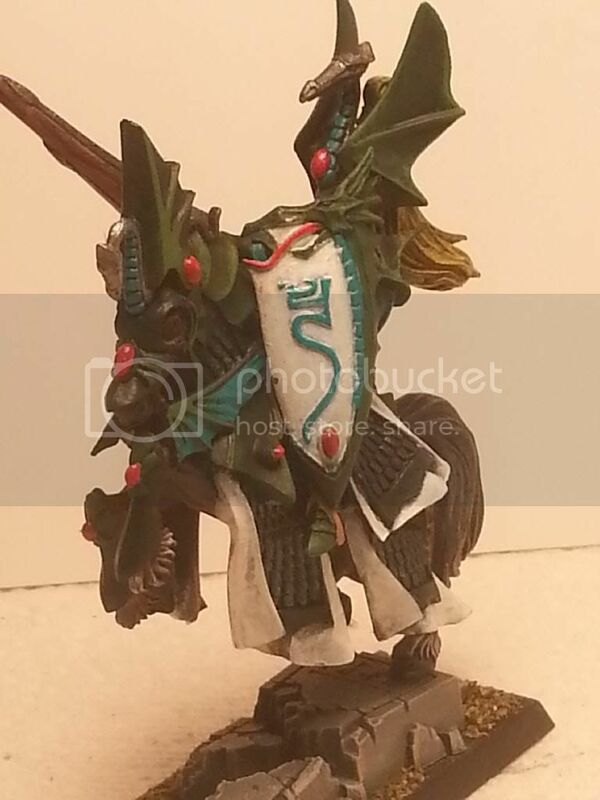 One other thing, maybe run the black wash over the brown of lance, and definitely over the shield (over the whole thing and touch up all the colours). Please take everything I've said with a grain of salt - I don't mean to be demanding or pushy, just giving you ideas to play with. 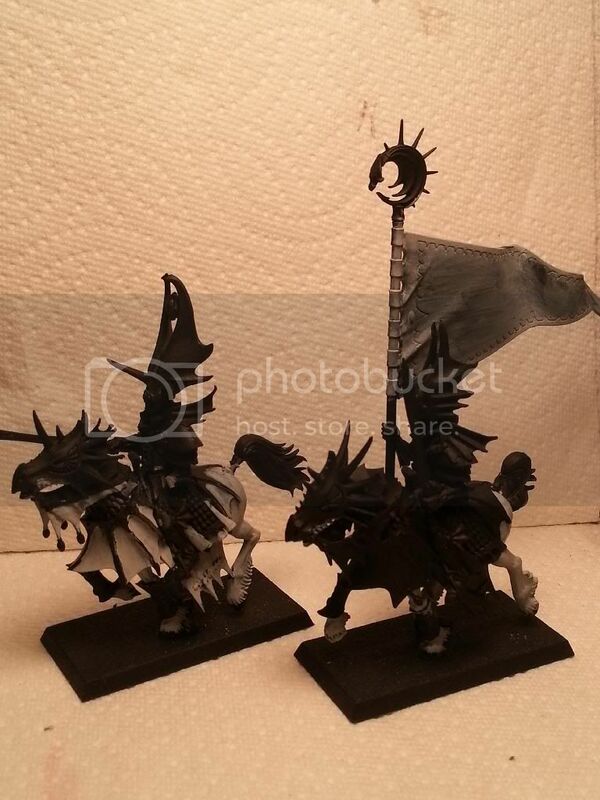 I did a wash with a transparent woodgrain on the wood part of the lance (black for the rest). Will definitely consider the shield, and I think you're right about the lighter green around the scales. How about just run the wash around the edges where the metal comes into contact with the wood? Took a break from the mounted noble to knock out an eagle. 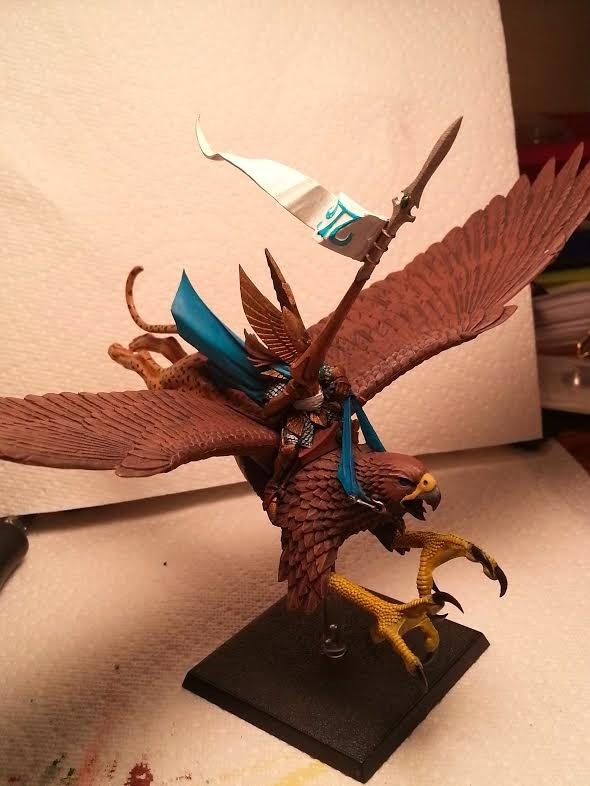 Yllthiir, the eagle! 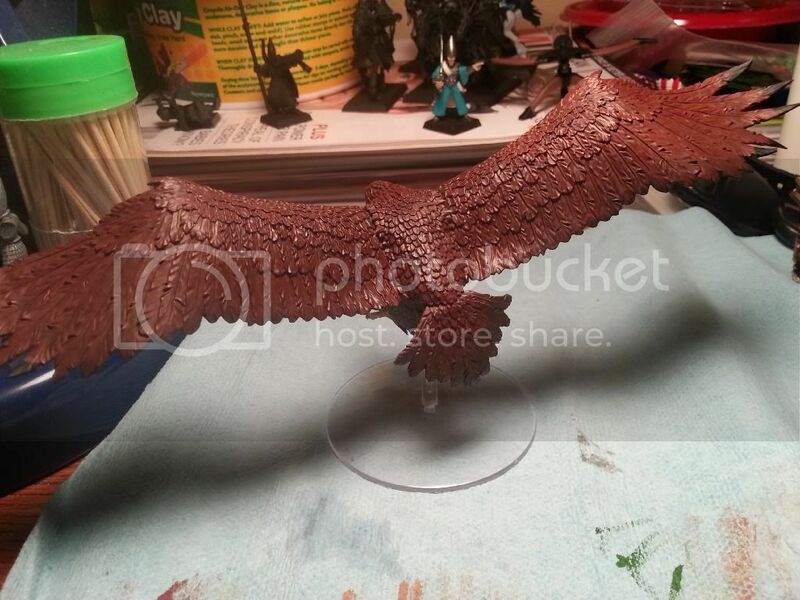 Need to work on the base...he's one of the Hobbit eagles, and I figure I'll have to mount him on a square base rather than the round base he's on to be able to do base-to-base contact. It's on my to-do list. Last edited by Duranthalis on Fri Jan 17, 2014 4:40 am, edited 1 time in total. Taking a quick moment to jot down some thoughts on where I'm heading with my next project. 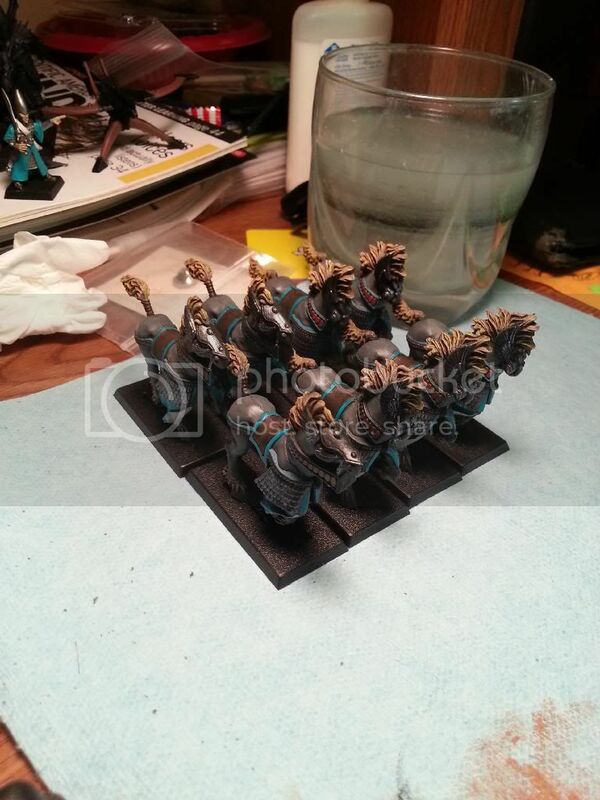 Currently about halfway done assembling a box of 8 silver helms (painting the horses in their entirety before assembling and painting the riders ... might be a little more time consuming but I think I'll be happier with the results). 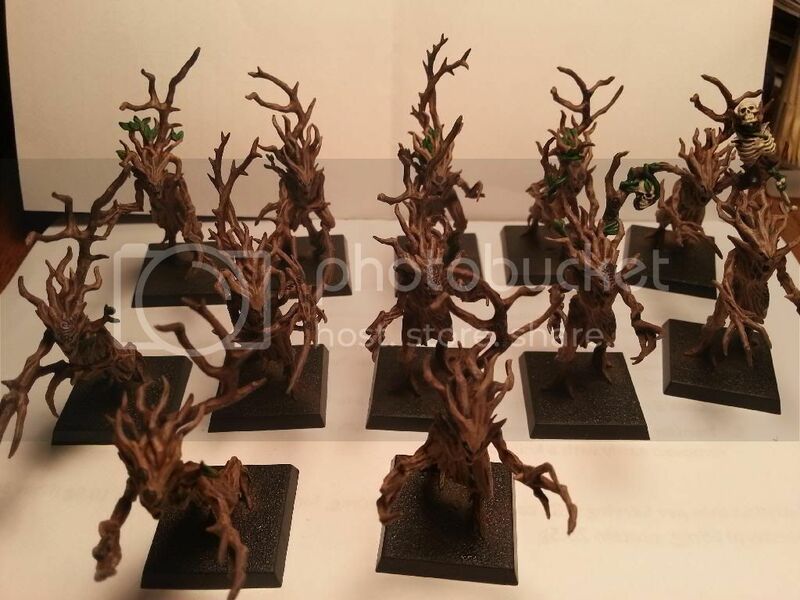 Prepping for a campaign at my local GW store...and it looks like it'll be interesting! Geared more for people starting out in the hobby (and to promote the triumph & treachery supplement) we're doing 4 weeks of T&T at 800 points and then mixing up the remaining 4 weeks between T&T (1200 pts) and Storm of Magic (1800 pts). The interesting part of the campaign (and most fun from a hobby aspect) is the "Special Character" rule that they came up with. We get a free 500 points (that doesn't count against the list total) to create our own custom general from our army book. Start with a lord/hero for the base statline and points value, and then add in special rules/items from other units (with the points guesstimated from items that give us equivalents). Once we come up with our custom general, we have to submit it to the campaign coordinators for review and approval. Over the course of the campaign, we can use our custom general for any game, with the limit being that the character is only allowed 4 deaths, after which we lose them for good. 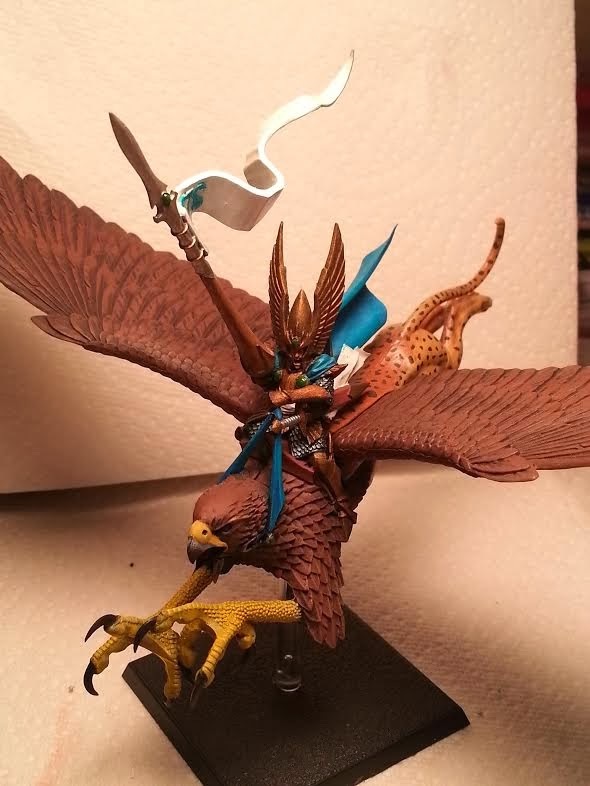 I figured it would be fun to try out a mage on an eagle, and just as much fun to customize out my character! The fluffy bit that I decided on was that my mage is the leader of an expeditionary force seeking to locate and, with relics from Asuryan, awaken dragons in the world to bring back the glory of the dragon princes (a lofty goal). As far as unit choices, for fluffy reasons I plan on limiting myself dragon princes (as they're to receive the greatest benefit if dragons can be located and awoken), silver helms (who aspire to rise to dragon princes), lothern sea guard (marines crewing the eagle ship that the expedition is using), RBTs (again, crew from the eagle ship), and phoenix guard (protecting the relics! ), as well as some mages (apprentices). Was debating if I wanted to add in swordmasters (under the premise of them being assigned to protect a wizardly expedition). Of course, pictures will follow ... but wanted to put down ideas that were floating around in my head before I forget them, and figured this is as good a place as any! How'd you come up with the points for your AM? 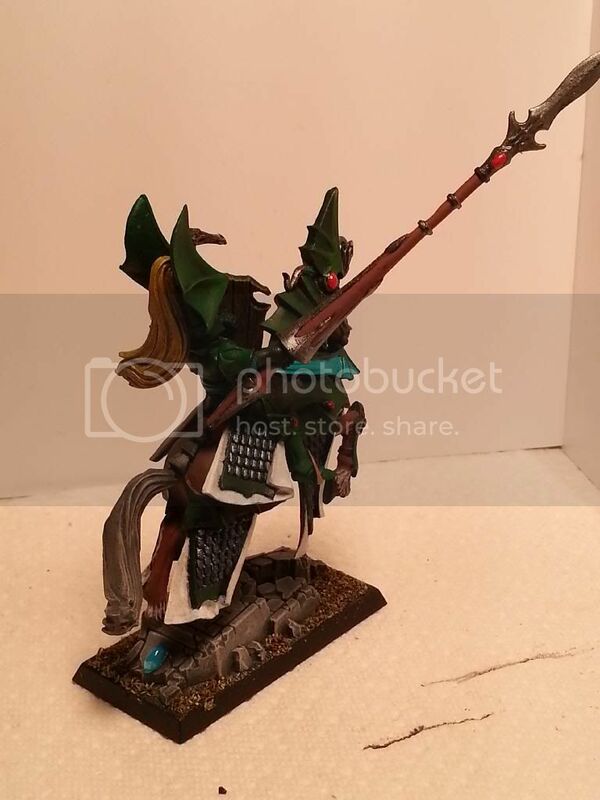 I ask because you're sporting 1 rule of the Everqueen, and only 1 of her items, plus a lone item from Alith Anar... and coming it at more points than either of them. It makes it seem as though you're saying the Stone of Midnight costs more points then Chaos Bane, Touch of the Everqueen, Shieldstone of Isha and Stave of Avelorn put together. I think that's overestimating its cost. Maybe more like 315? Figure you can get a 4++ for 45pts, the -1 to hit expand it to... 65pts? Star of Avelorn say 25pts (It's only 1 wound within 12"). So that's 90pts in magic items which would make your guy 310pts. Not sure how I'd cost Boon of Isha, but compare it to Annointed vs Prince since his ItP is similar that's a 90pt difference between them, but that 90pts is for -1Ld, -1BS, -1A, MR(2), 4++, 6++ to unit, and ItP. So maybe ItP is worth 15pts? That's my analysis anyway. I feel you're over costing yourself to be almost 400pts. 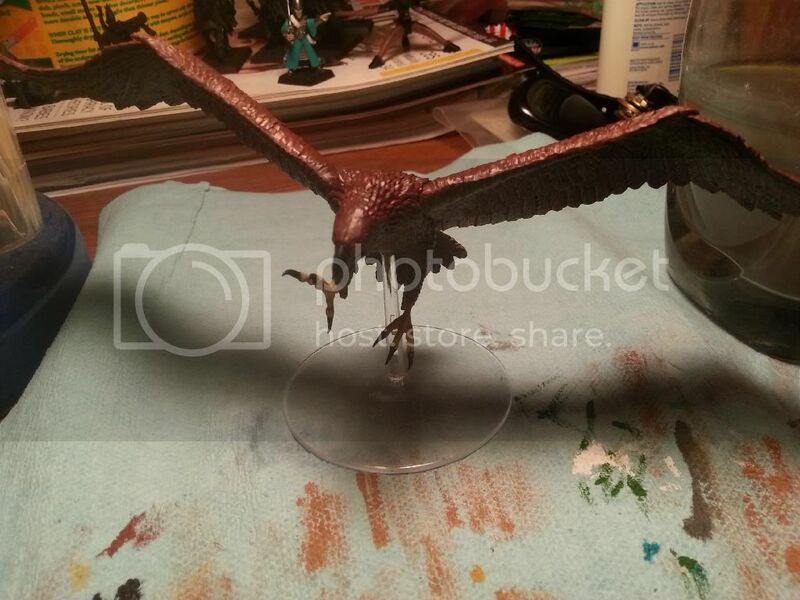 Same goes for Eagle Upgraded eagle is 65, Swooping Strike is 25, so that's 90, I don't think an attack is 15pts. That's minor though. 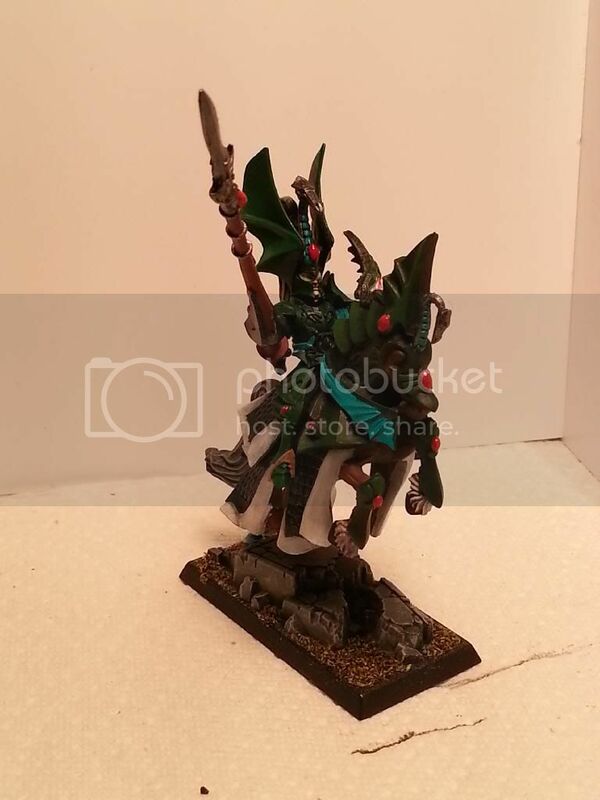 Just my thoughts though, I'm not a GW design team member. Campaign sounds cool though, good luck in it! I probably was overly generous on paying out points for abilities (I think I valued boon at 75 pts, as I wasn't sure how the ruling council would feel about a cheaper immune to fear/terror and magical attacks for an entire unit). I paid out 15 for the extra attack on the eagle (a similar magic item granting +1 attack would cost 20 pts), and then figured about 50 each for the magic items (4++ save item is 45 pts, figured 5 pts for a -1 to hit from missile attacks sounded about right). Like I said, I was probably a little too generous paying out points... but, like you, I'm no designer. My thoughts were more along the lines of "Pay a little more, increase chances that it'll be approved" rather than try and overload abilities and nickle and dime the points values, ending up quibbling with the coordinators. 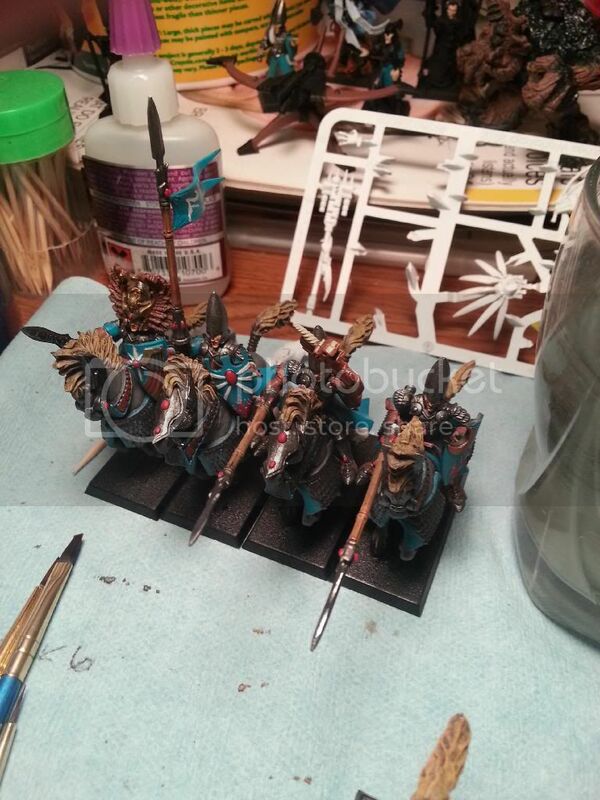 Finished up the horses for my SH unit...mostly. Have to go back and do all the gems, but I plan on leaving that tedious task for when I'm doing the gems on the riders as well. Have you considered making those horses dappled? Imo it looks fantastic as a horse colouring and is surprisingly easy to do once you've got to the stage you're in. Just dab on a very watery (not quite as wet as a wash, but certainly wet enough to be translucent) grey ~1.5 shades lighter than the horse flesh, then dab in the middle of those with a very watery shade lighter than that. Even if you don't, they're very nice as they are. Been busy with a new term at school starting up (seriously, don't these instructors know that I have an army to paint when they assign 4 chapters of reading along with 5 page essays?! 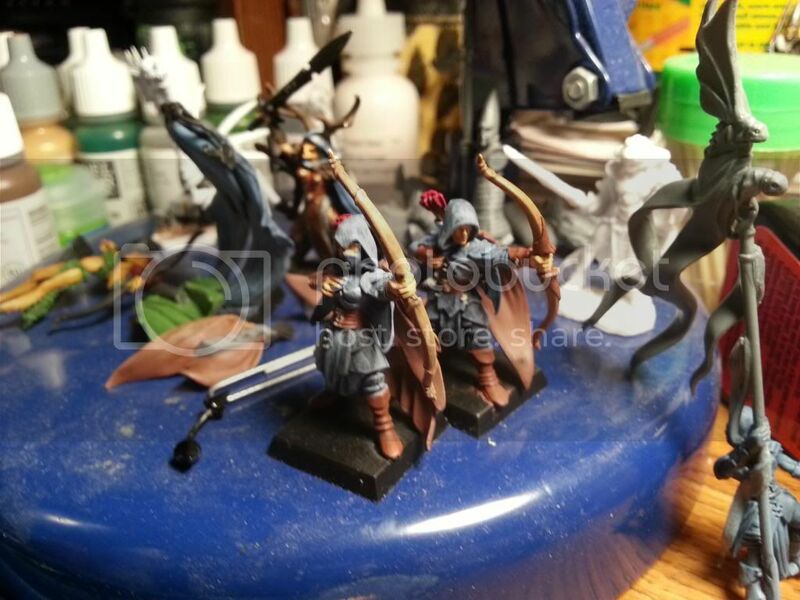 ), but I managed to swing by my LGS between classes today and they had a box of wood elf glade guard for 50% off, so naturally I jumped on that, figuring that some shadow warriors are in the future for my HE army. 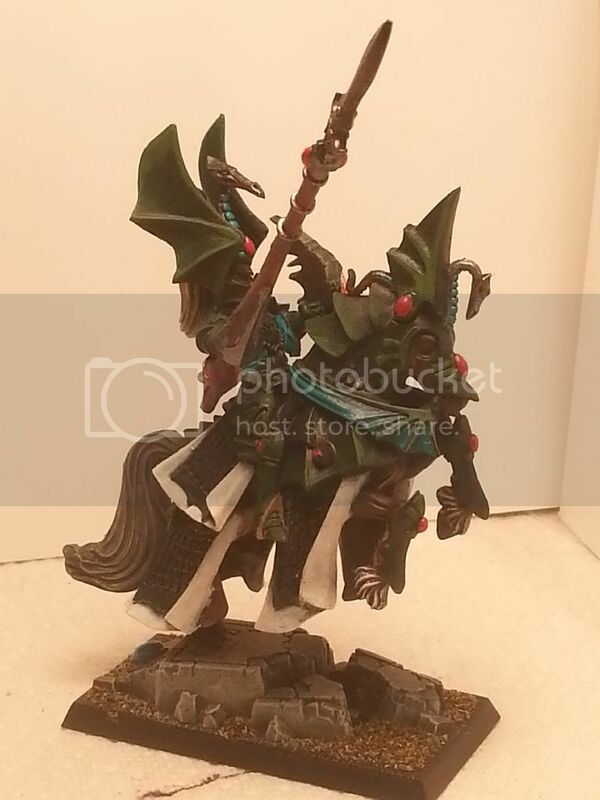 Anyone have advice or tips on converting them over? 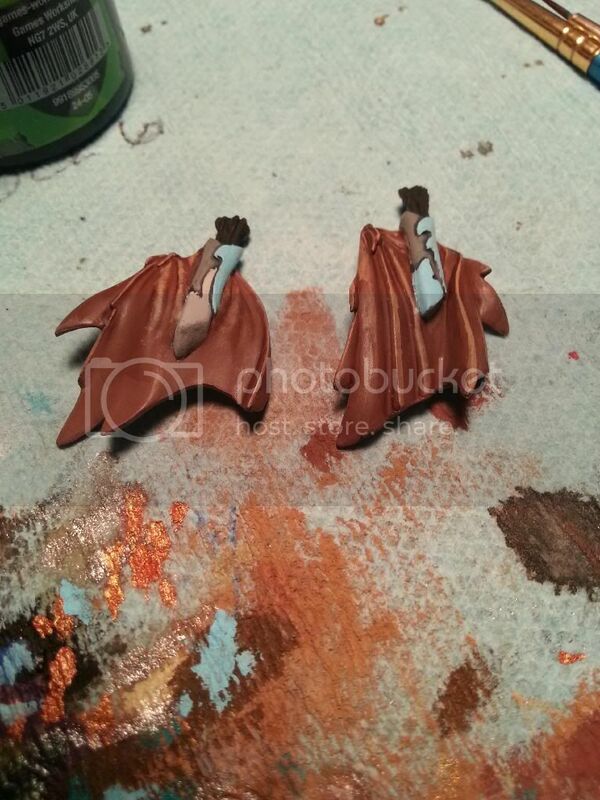 I was thinking of using some of the hooded heads from the kit along with a mix of the SW heads left over after building my sisters of avelorn. 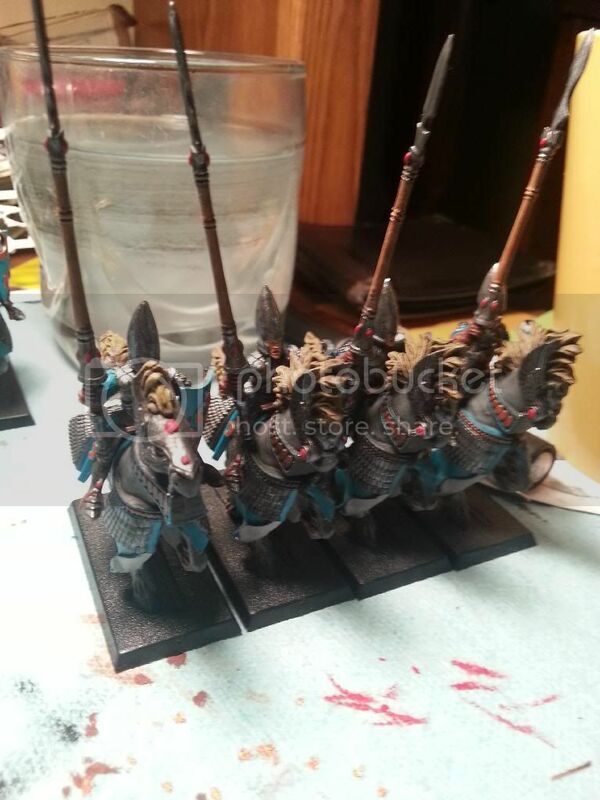 Finished up my unit of Silver Helms (well, pretty much). 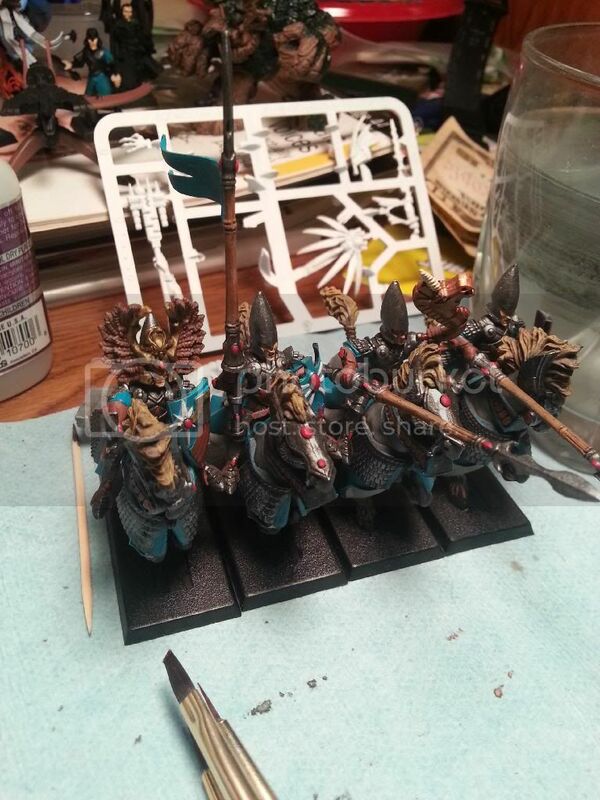 I need to go back and base them, and maybe work a little more on the standard (clean up an attempt at freehand). Just happy to have a unit completed! 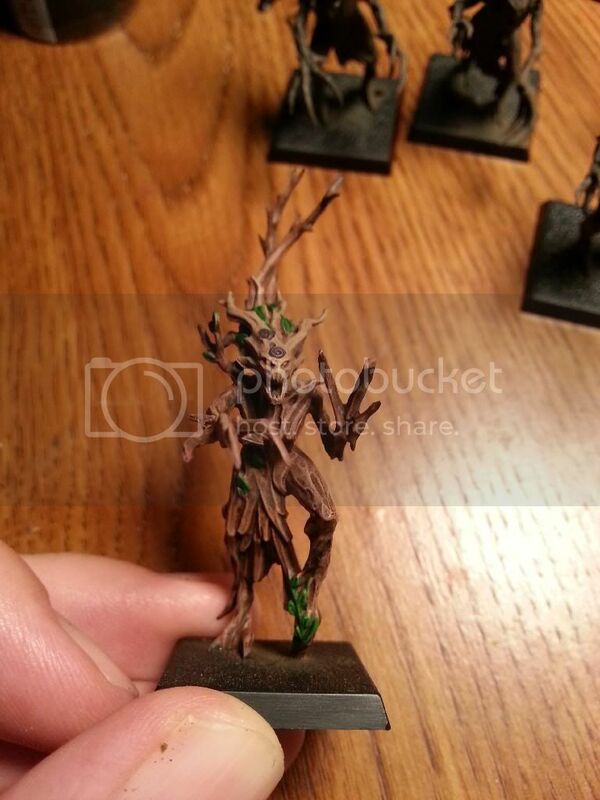 Decided to use a Reaper Mini's spirit of the forest as one of my Treemen for the WE army that I'm assembling. 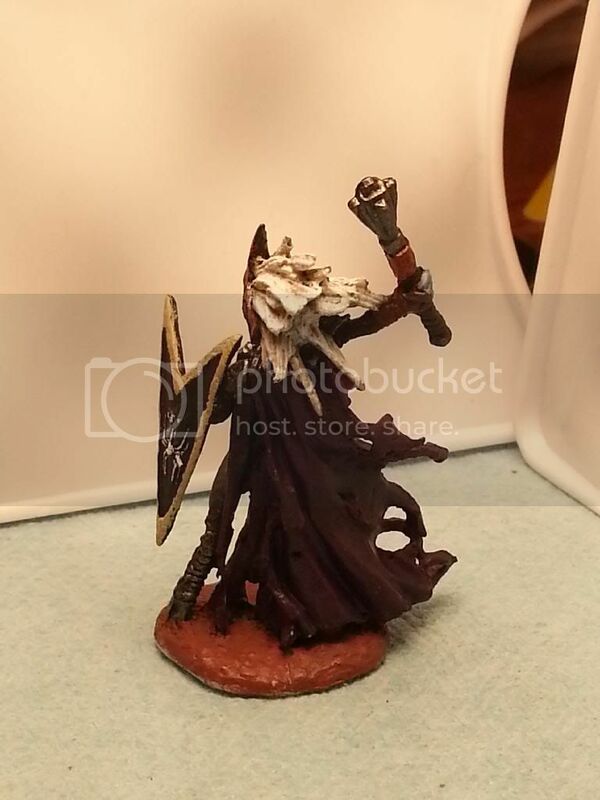 Need to base him still, but he should work. 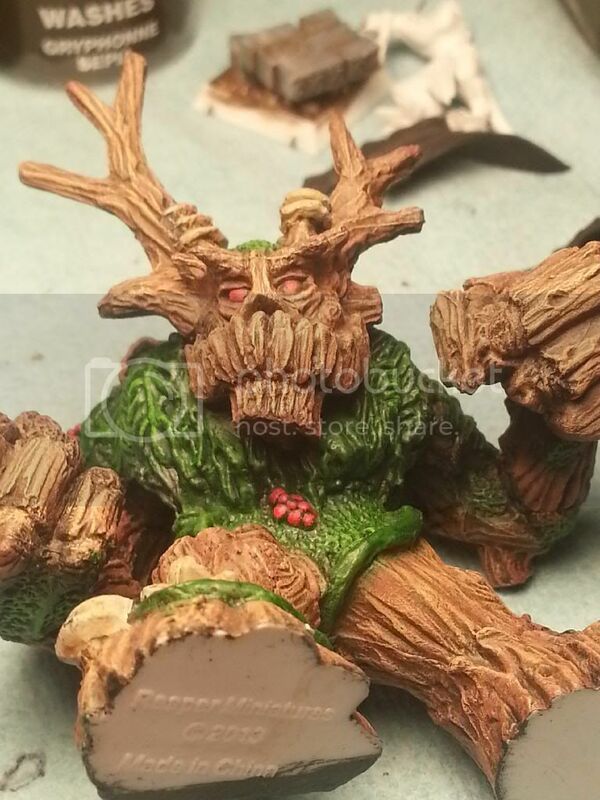 The Treeman Ancient is still in the process of being sculpted (have the armature and first layer of resin on the base, need to get busy sculpting and finish him up). 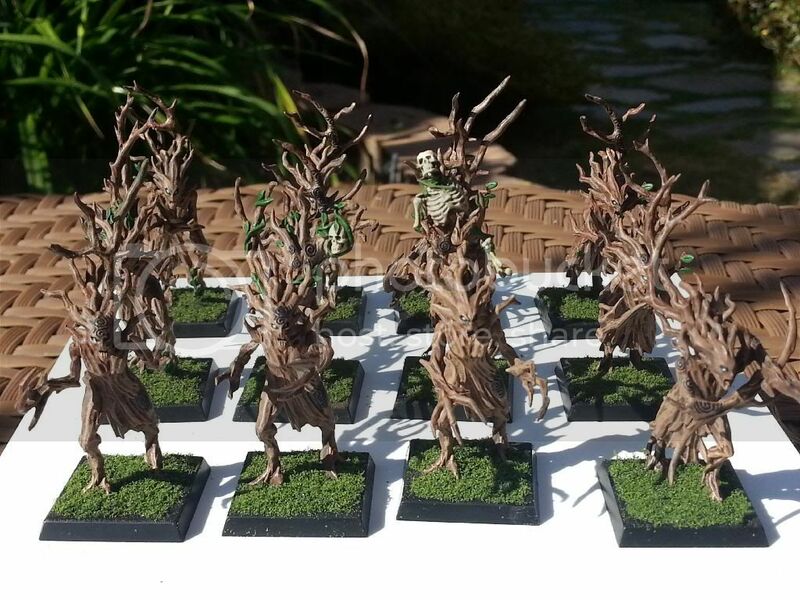 Dryads completed! 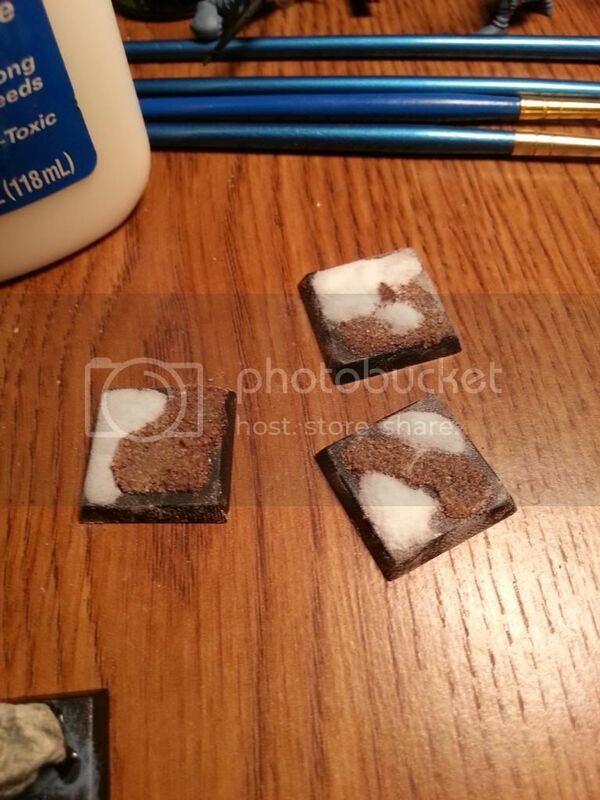 Well, except for the basing... I'm going to work on that today, along with some other projects. Originally, I had gone with orange eyes on them. 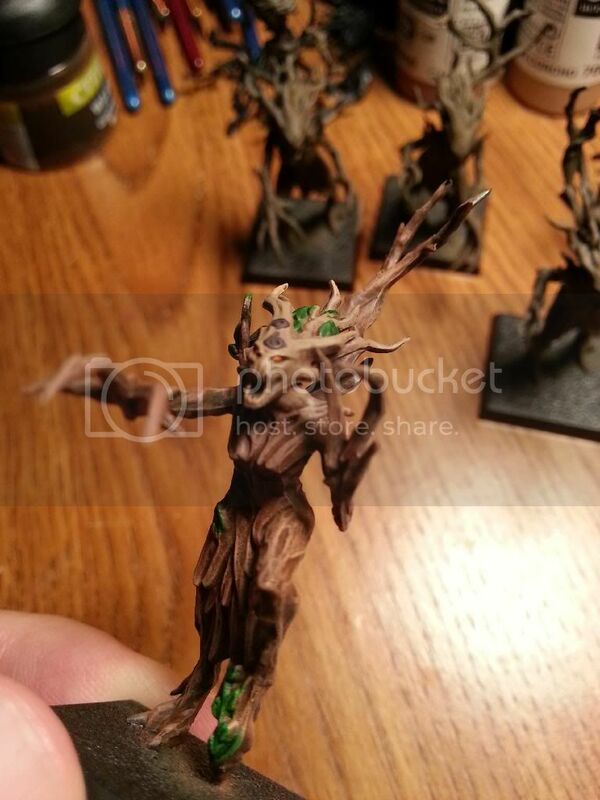 Got about 4 or 5 dryads in, and decided that the orange just disappeared into the model. This realization came about when I looked at them from about 2 feet away and couldn't tell if I had done the eyes or not...so I went through and now all of them have the same look to the eyes. The new eyes are a lot better! 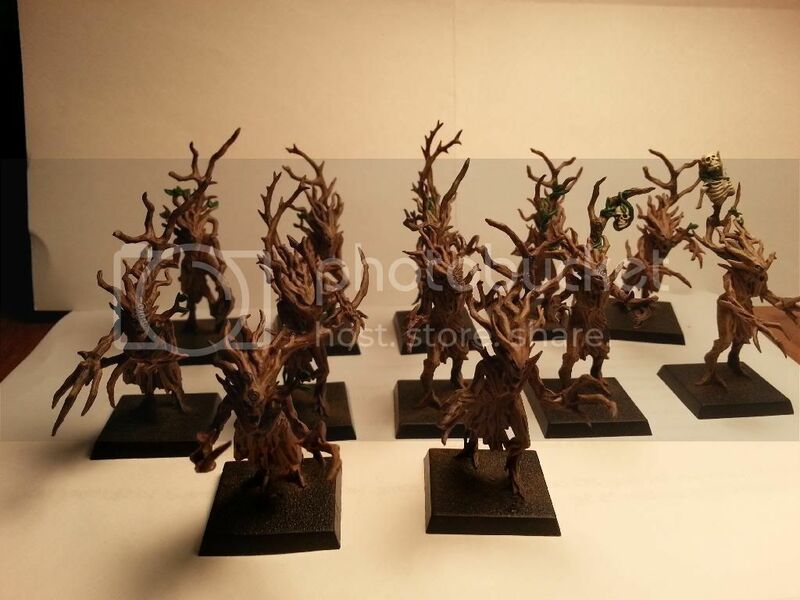 I like how much they actually look like wood. 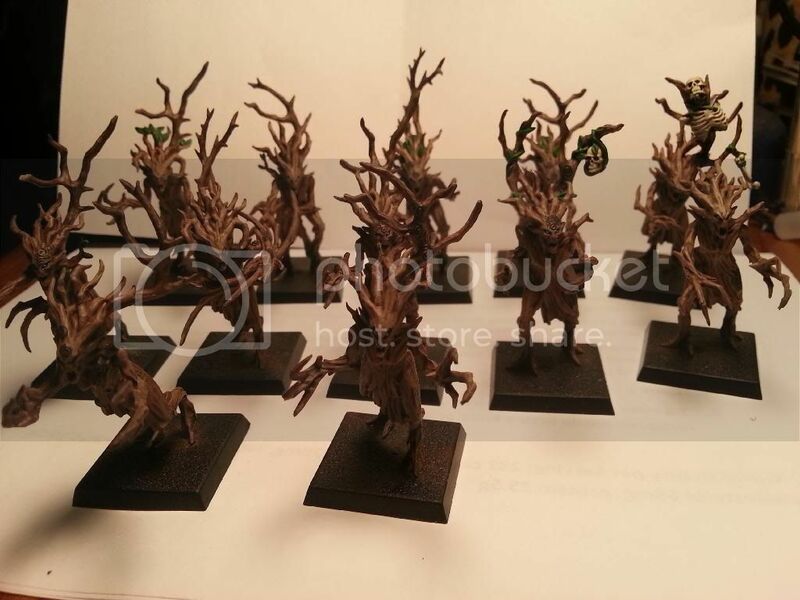 Now to get cracking on some heroes ... and maybe the 32 glade guard who are staring at me from the sprues. 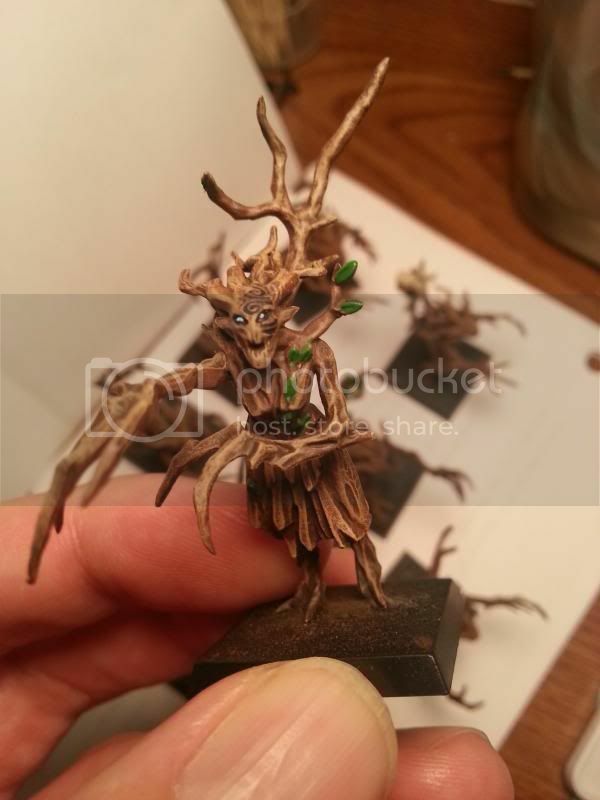 nicely done dryads and treeman. 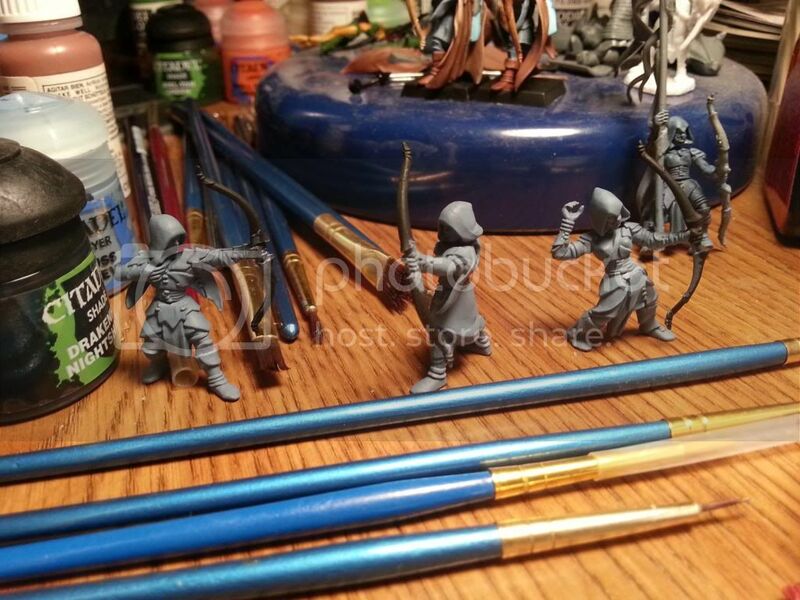 Three glade guard waiting for me to move on to them ... yes, they're primed (black) and base coated (Russ grey). Finally, the first two of the Winter Guard unit that I'm currently constructing... waiting for me to learn how to do snow bases correctly to finish them off completely.